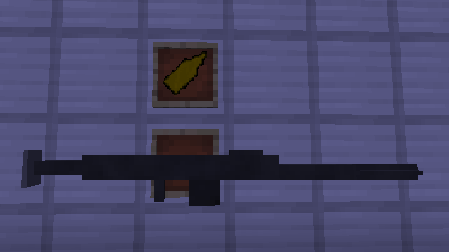 This Update Fixed The Rifle Bug And Added A Random Easter Egg (Have Fun Finding It, It's REALLY Wierd), Which Is Going To Turn Into A Really Cool Weapon In The Future! Report All Bugs In Comments Below. 90+ Diamonds O.O Thanks So Much Guys! This works for Minecraft 1.7.2 and untested for 1.7.10. If You Made A Server That Supports This Mod PM Me The IP And I Will Feature It In The Post! 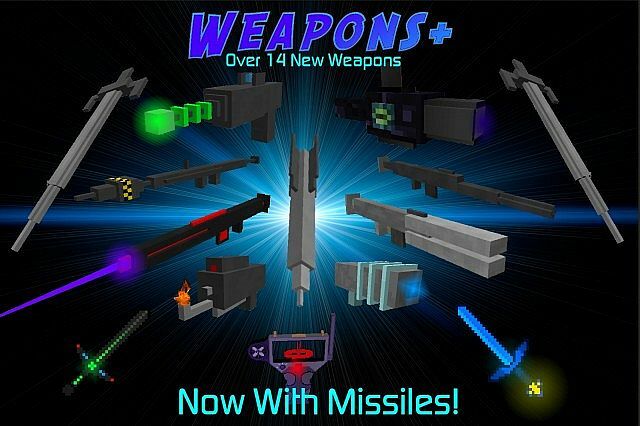 This mod adds alot of new weapons to the game, such as guns, swords, and more. 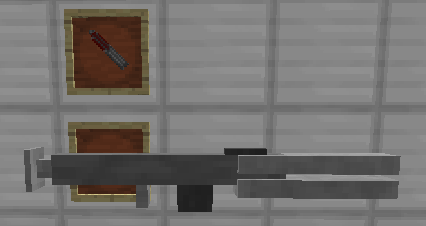 All guns have 3D Item Renderers and Models! 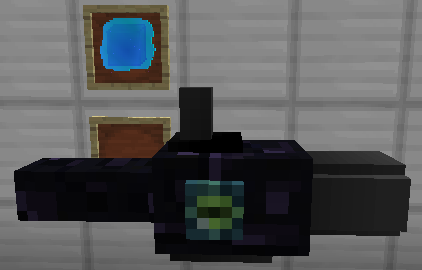 This mod also uses 32x32 textures. It's still in very early development, and will update frequently, but it is now ready to be used. All items now have recipes and ammo/limits and are no longer OP. Launcher A Projectile Explosive That Explodes On Impact. Uses "Rocket Propelled Grenade" For Ammo. Shoots A Beam Of Fire That Ignites Everything It Touches. Uses "Gas Tanks" As Ammo. When The Durability Reaches 0, It Won't Work Unless You Have A Gas Tank In Your Inventory, In Which Case It Will Be Used. 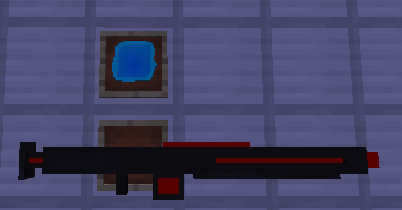 This Weapon Is A 1-Hit Kill On Most Mobs. To Fire, Hold Right Click (Like Eating A Steak). Uses Railgun Ammo. Uses Energy Crystals And Has 3 Different Modes [Damage, Stun, Explosive]. Shift + Right Click To Change Modes. The Durability Is The Energy Level. It Will Use Up An Energy Crystal When It Reaches 0 To Recharge. Shoots 16 Snowballs At A Time And Creates Snow Blocks Where They Land. Unlimited Fire In Creative Mode. Uses Energy Crystals. Creates And Fires Enderpearl Entities. It's Also Oversized. When The Durability Runs Out, It Can Be Restored By Having An Energy Crystal In Your Inventory. 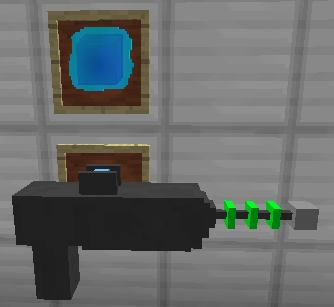 A Weapon That Uses A Single Energy Crystal To Activate. While Activated, User's Speed And Jumps Are Much Faster. A Sword That Poisons Mobs And Players When Attacked. Same Strength As A Diamond Sword. A Sword That Can Switch Modes [Damage, Fire, Super Knockback, Stun]. Shift + Right Click To Switch. A Sword That Teleports You Like An Enderman. Hold Shift + Right Click For 4 Seconds To Teleport Randomly. Right Click To Throw. Can Be Picked Up After Hitting A Mob. A Bit Glitchy In Survival. As Long As The Player Wears A Full Set, The Player Will Be Completely Invisible! Not Very Protective. The Most Important Thing In The Missile System. 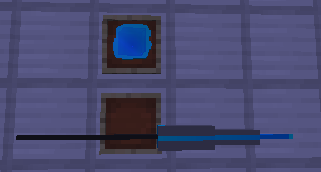 Right Click The Ground With This To Open A GUI. From The GUI, Select The Missile You Would Like To Summon. It Will Only Be Summoned If You Have That Type Of Missile In Your Inventory, And You Are In Creative. There Are 3 Types Of Missiles [Conventional, Incendiary, Nuclear]. 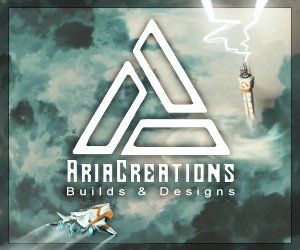 They Are All Crafted And Must Be In Your Inventory To Launch Unless You Are In Creative. Conventional Missile: About The Same Strength As TNT. Has A Red Beam. Incendiary Missile: Lights Everything On Fire. Has A Blue Beam. 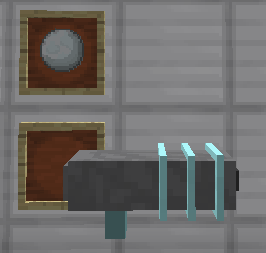 Right Click This Block With Uranium Ore In Your Inventory To Convert It Into Refined Uranium Rods. GUI Will Be Added Later. I Have Made Several Changes To The Code, Including Adding NBTCompoundTag Data To Make This Mod Work On Multiplayer. I Couldn't Find Any Issues Yet, But If You Do, Post It In The Comments. When i use the throwable sword it crashes my game please fix it!!!!! 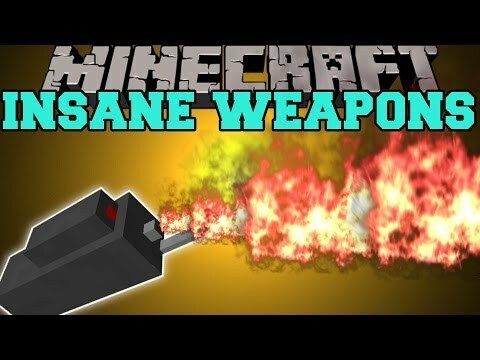 when i try using the pulse thing it crashes and when i try throwing da knife it crashed and more FIX IT!!!!!! LazerMan47. You are awesome for doing such a cool mod. Dont let anything get you down and hopefully you can get this updated to 1.12 :) can i suggest maybe a Wesome for easy mining and a chainsaw?? Hey guys, I'm very sorry for disappearing off the web for a while, I have gone through some dark times and things were just not in the right place for me to be doing this. But now, since things are better, I am going to try to update my mods to 1.10! I would to like to take this moment to apologize to everyone who is dissatisfied with my failure to keep this updated and I promise I will try to make this mod great again (wait what ಠ_ಠ). Unfortunately, I have a lot of other things to tend to, such as college and my future career in computer programming & virtual reality, and there is a lot of code that has changed in the new version of forge, so it will definitely take some time. I will say that I've missed doing this and it's great to be back! I will most likely be moving my updated work onto my website [link] and to a new account I have yet to create. I look forward to being able to modify such a diverse game and it honestly doesn't get old, even after years of doing it. Great to hear your trying to update to 1.10! Can't wait! Although I would suggest eliminating the bow-style charge up. It would make them feel more like the real thing. for some reason it just doesnt run. i am using 1.7.10 forge but also it says in the title 1.7.10. Any help? You should add a particle mushroom cloud to the nuclear missle. Nice mod, but when ever i try to throw the trowable sword my game crashes. Same here. I was opening my door, but I forgot I had the sword in my hand, and the world got corupted. 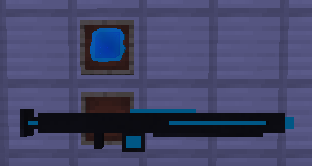 nice mod, diamond, does any1 have a weapons plus server Ive beem looking everywhere, so please reply if you can make or have one, or know one, I would aprieciate it. Gave the mod a diamond. This mod is spectacular and my favorite Multiplayer gun mod out there. Only problem with it is the throwable sword corrupts world saves. This bug is keeping me from putting it in a pack that I'm building. PLEASE fix this issue, it would be greatly appreciated and would give this mod a massive boost. I had the same problem. Check how fast your game runs, it might not be able to render the action for it. but i am in creative so that might be the problem, is it? okay, and thanks for the reply :D , Diamond ! wheres the 1.7,10 download link? you should add the Mastersword as one of the weapons! is there a version for 1.6.4? next awesome thing that should be added is either aircrafts (modern and futureistic) or more military based armor! Where's the download for 1.7.10, is it the 1.7.2 link just not updated or does the one I'd be downloading from the 1.7.2 link work for all 1.7 patches? It corrupted my world, thankfully it was a creative test world that I didn't care about. EASY FIX: Don't use throwable swords =P. Yo, mod maker! A 1.6.4 version please! Hey guys srry for the lack of replies ive been away, but im back now :). Ill fix the rifle bug as soon as possible. The Laser Blaster crashes me when I use it. Please fix :) But aside from that lovely mod, good job mate! However the elecricity would be blue rather than red. It would be powered by a battery. Try adding some kind of like fallout Fatboy ( Mini Nuke Launcher ). Make this for 1.6.4 forge. More people have it because it's been arond longer. Can I use this for a modpack? 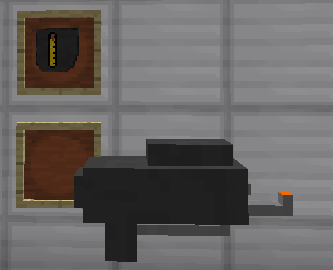 [1.6.4/1.6.2] [Forge] Derpy Pig Mod!